As an alien invasion continues in this YA sci-fi sequel, humans conspire to fight back. It’s the 22nd century, space travel is a reality, and so are dangerous alien enemies. In the first book, Invasion: Earth (2013), two 17-year-olds, Chuck Holloway and his friend Farley Fillion, were in danger on two fronts: bullies at their Toronto high school and aliens with a hunger for human flesh. To gain strength and retaliate, the friends joined Yu’s martial arts training dojo on Eris, home to a small human colony. A valued adviser is Grammy, Chuck’s grandmother, a high-ranking member of the Planetary Space Agency. Now, just over a month later and following a battle, the team has endured losses; high school bullies Mike, Gaz, and Lexi have joined the aliens; and abductions are increasing. At Yu’s dojo, headquarters for the rebellion, the group (including Chuck, Farley, Grammy, and others) makes plans to learn more about the aliens, find their weaknesses, and attack while organizing a rescue mission to Earth. Meanwhile, captured humans try to escape their fate as entrees or breeding stock, and a foursome of peaceful aliens makes contact with the Eris colony in the hope of joining against the common enemy. 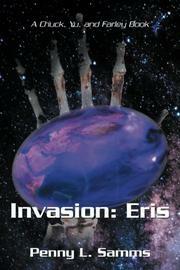 As the story ends midconflict, things look bleak for Eris and Earth, but an alien device may offer assistance. Samms’ (The Rule Book: Rules for a 5-Year-Old, 2015, etc.) novel, conceived as part of a series, doesn’t stand alone well. A plot summary of Book 1 and a list of dramatis personae would have helped, as would a more resolved ending. While the tale delivers action, it often gets bogged down in the kind of unexciting scheming that involves sign-up sheets and schedules. Samms also fails to answer an obvious question: if the starving aliens can instantly produce delicious meals for human captives, why can’t they manufacture food for themselves? On the other hand, the friendly aliens are delightful. One dances rather than walks; another is obsessed with the number 14. The enemy aliens are given surprising depth as well. Some missteps, but the author shows impressive imagination with her aliens.